A petty cash reconciliation sheet is a business accounting document which is used to carry out a reconciliation of the physical petty cash and paid vouchers to the authorized petty cash float. Reconciling petty cash is an important part of the internal controls of a business. 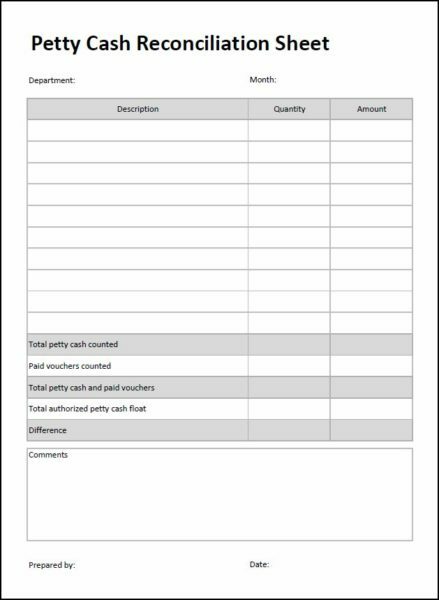 The petty cash reconciliation sheet provides a summary of the petty cash counted by denomination, quantity and amount together will a total of paid vouchers contained within the petty cash box. The total of the petty cash and vouchers together should equal the authorized petty cash float, any difference between the two is recorded and a comments box allows for an explanation of the difference. Finally the petty cash reconciliation sheet is signed and dated by the person who carried out the count. The PDF file available for download below, will help you to produce your own petty cash reconciliation sheets. The petty cash reconciliation sheet is available for download in PDF format by following the link below. Users use this petty cash reconciliation sheet at their own risk. We make no warranty or representation as to its accuracy and we are covered by the terms of our legal disclaimer, which you are deemed to have read. 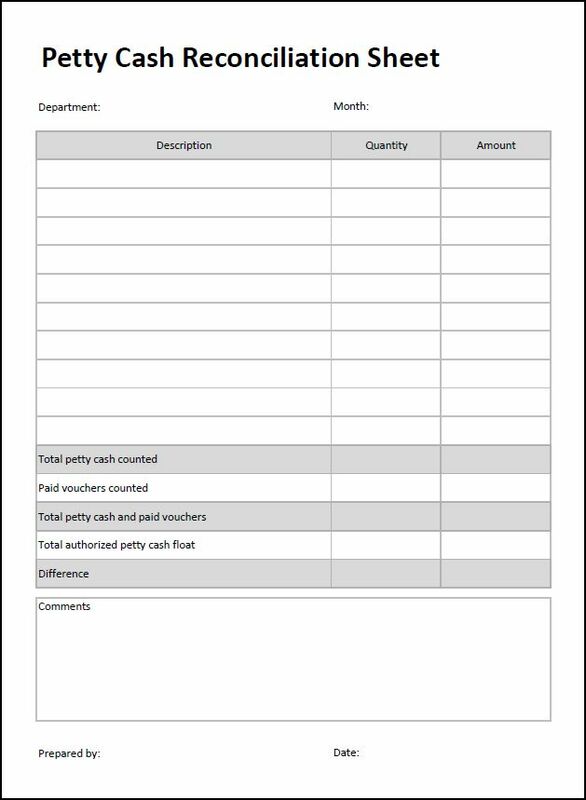 This is an example of petty cash count sheet template that you might use. It is purely illustrative. This is not intended to reflect general standards or targets for any particular company or sector. If you do spot a mistake in the petty cash count sheet template, please let us know and we will try to fix it.